Mange af os har stiftet bekendtskab med finner af G10 typen, dvs finner der er lavet af glasfiber. Deres unikke grøn og gullige farve gør dem nemme at spotte, og de har helt klart en række fordele i forhold til carbon finner, den mest markante er at de er nemmere kan repareres efter en tur i en sten eller på bunden. Men hvorledes bliver de fabrikeret ? Hvad ligger bag ? For meget lang tid siden under en søgning på nettet faldt jeg over nedenstående artikel. Sidenhen er websitet blevet opdateret, og linket fungerer ikke længere. Til al held kopierede jeg dog artiklen som giver et interessant indblik i det at producere windsurfing finner ved hjælp af CNC fræsning. Artiklen er baseret på input fra finne producenten Tectonics, interessant, lidt nørdet og windsurfing mæssigt ikke helt opdateret, men trods alt benyttes samme teknologi i dag, det er jo ikke raket videnskab. A more efficient airfoil design combined with computerized manufacturing technology is helping professional windsurfer racers improve their performance. The author is a former aerospace engineer who applies optimized aerodynamic profiles to the fins of windsurfing boards which are critical to their racing performance. Accurate machining is critical to the success of this approach and it was achieved by using an inexpensive CNC gantry router that produces the fins to a much higher level of precision than conventional manual methods. High performance windsurfing boards, which are generally 7′ 8″ to 9′ 4″ long, operate normally in a planing condition with only the rear one-fourth to one-third of the board touching the water. This makes it impossible to use a centerboard like those used in a sailboat to counteract the side force of the sail. The only device providing counterforce is a small fixed fin at the rear of the board. The side force provided by the fin stabilizes the board and balances most of the side force generated by the sail under normal operating conditions. By allowing the use of larger sails in higher winds, the amount of balancing side force generated by the fin controls indirectly affects the level of attainable forward speed of the sail board. In many cases, the performance of this fin is the most significant factor in determining the overall performance of the board. The fin operates in much the same manner as an airplane wing. However, unlike the wing of a conventional airplane, the fin must work in both directions. In this respect, it is similar to the function of wings used in certain fighter and aerobatic airplanes that are designed to fly equally well upside down. While racing windsurfing fins have traditionally been designed by trial and error, it occurred to the author, who worked for 14-years as an aeronautical engineer, that optimized airfoil designs which have been developed for aircraft could be transferred to sailboard fins with little or no modification. Many of these designs were developed by the National Advisory Committee for Aeronautics (NACA), the predecessor of the National Aeronautics and Space Administration in the first half of this decade. 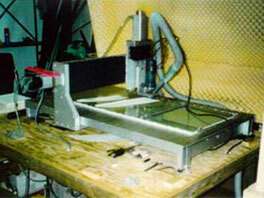 The problem in implementing this idea was how to produce these airfoil designs to the required high level of accuracy. Fins for mass produced windsurfing boards are produced from injection molded plastic. These fins are not used for highperformance boards because the injection molded fins change their shape slightly as they cool. These small changes can drastically reduce the performance of the board. Fins for high performance boards are traditionally produced by far more expensive manual methods. An experienced craftsman begins by building a series of templates that describe the contours of the fin. The craftsman then uses these templates as guides in producing the final form with a hand grinder. It typically takes about a day to make a high performance fin. The accuracy of this approach leaves much to be desired so it is necessary to test the fins in the water to determine whether or not they are effective. A top name competitor will typically accept 2 out of 10 fins produced by these methods. When the author originally developed the idea of building fins according to optimized aerodynamic profiles, he assumed that it would be necessary to build them using conventional manual techniques. While, as explained before, these methods are quite expensive, an even greater problem in this case is their lack of precision. Precision is much more important on fluid dynamic profiles because they are more sensitive to minor dimensional inaccuracies which can cause the flow to separate from the fin, suddenly reducing the side force and, in extreme cases, causing the board to suddenly shoot sideways (“spinout”). It was no secret that much greater accuracy could be achieved with CNC machining but this alternative was not given serious consideration because it was assumed that the machinery and software required to implement this technology would cost at least $100,000. Unfortunately, the market for fins for high performance sailboards is not large enough to justify this expenditure. Bernie Brandstetter, a former Worldcup racer and the first manufacturer of CNC-milled sailboard fins on Maui, introduced the author to the Techno-Isel router. Tectonics, Maui purchased a 3-axis CNC router from Techno, Inc., New Hyde Park, New York, with the MAC100 controller for only about $18,000. This system has an accuracy of ±0.1 mm (+0.004) in 300 mm and a repeatability of ±0.01 mm (±0.0004). Techno machines have anti-backlash ball screws for play-free motion which makes it possible to produce circles which are accurate to the 0.0005″ machine resolution. The ball screws have excellent power transmission due to the rolling ball contact between the nut and screws. This type of contact also ensures low friction, low wear and long life. The ability to achieve this accuracy at a low cost made economical fin machining possible. An aerodynamic reference book provides coordinates of the profile. These coordinates are then entered into the Mastercam® CNC programming software package developed by CNC Software, Inc., Tolland, Connecticut, and provided with the Techno router. The result is a plan view representation of the profile. The next step is scaling the profile to create 30 to 40 ribs which give the fin’s planform its third dimension. The reference book provides the unit length of the profile used. The author wrote a BASIC program that generates an array of points for each of the ribs scaled to the cross sections of the fin’s planform. The program produces its output in CadKey’s™ CADLINK format which can be read by Mastercam®. Mastercam® reads these points as a series of splines. A surface is then applied to these splines using Mastercam’s® lofted surface feature. Another feature of the program, called synch, makes it possible to space the chain intervals closely at 0.2 mm for the first 10% of the profile where accuracy is the most important. Chaining intervals are spaced at 0.6 mm for the remainder of the curved portion of the profile and at 2.4 mm for the flat portion in order to save time generating the tool path and reduce the file size. The milling machine makes it possible to produce fins to precise aerodynamic profiles at a cost that is less than the cost of hand-producing high performance fins. It takes about 4-hours to produce each fin. Feed rates are limited because the G-10 plastic material used, the same type of material used to produce printed circuit boards, is so tough. The material is supplied in half inch panels consisting of about 25 layers of fiberglass embedded under pressure in a plastic shell. A carbide bullnose endmill is used to cut this material. This tool is 3/8″ in diameter, has 4-flutes, a 1/8″ flat section around the centerline and 1/8″ radius on each corner. 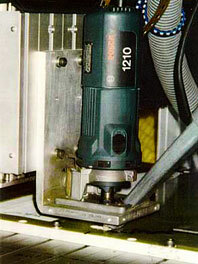 It makes a smoother surface than the more common ball nose end mill. The (NACA) 63A010 profile is one that has been found to provide excellent performance under a wide range of racing conditions. The maximum thickness of this profile is 35° back from the nose. Some modifications are required for aerospace profiles because they are designed for considerably higher-speed operation than windsurfing fins. Tectonics, Maui uses a computational fluid dynamics program that lets them simulate the operation of the profiles at the 30 to 40 mph speeds common to sailboard racing. The gantry router provides sufficient accuracy to make systematic dimensional changes which allow performance to be optimized. The most critical consideration is the prevention of the onset of turbulence, which causes a phenomenon similar to stalling in an airplane. The fin than loses its side force and the sailboard begins rapidly moving sideways. The accuracy of a computer milled fin makes it possible to reduce the wetted area of the fin by 10%, reducing friction drag and increasing the attainable speed of the board. Many races have been won with fins produced by computing milling. Anders Bringdahl is only one of the well-known racers that have used the fins to beat their best previous times. Other fin producers have tried to copy these profiles using manual manufacturing methods and/or copy milling machines but found that performance is substantially reduced by machining inaccuracies. The aerodynamic profiles have also been used to produce molds, so far with mixed results due to uncontrollable shape changes (see earlier in this article), used to produce mass-market sailboard fins. All in all, computer milling technology is having a major impact on windsurfing by providing a better performing fin at a reasonable cost for the performance achieved. About the author: Gerhard Opel is a retired airline captain and a former bush pilot, having flown in the Alaskan and Canadian arctic. He spent 14-years as an aeronautical engineer working on various U.S. and European transport and fighter aircraft. He holds a Graduate M.E. degree from the T.U., Vienna, Austria and a M.S.C. (ME) degree from the Massachusetts Institute of Technology. He is also an enthusiastic board sailor learning a lot from testing his own fin designs. This entry was posted on Sunday, April 24th, 2011 at 07:00. It is filed under Generelt. You can follow any responses to this entry through the RSS 2.0 feed.